It was a Flightplanning-Saturday last week for me, and I had the great opportunity to go on a so called „route familiarisation flight“, which is necessary once a year according to our OM-A. I had choosen a flight to Tromsø, asked the crew well in advance if they were willing to have me on board, because -as far I know- that airport needs special treatment, and I did not want to disturb. I was welcome and started my flightplanning 3 hours befor SKED. As usual I started checking the technical status of the aircraft, the rotation, weather and NOTAM. Destination weather was pretty bad: strong crosswind exeeding our companies limits for landing, also snow on the runway with insufficient braking action, the sight was very low and my flight planning system does show me only one suitable alternate. A little bit less for such a flight … and also to provide alternatives for my crew, just in case the destination weather will get worse. Our companies „list of authorized airports“ (LOAA) did not show more airports, that were available as an ALTN for TOS/ETNC … so I have taken out some charts. 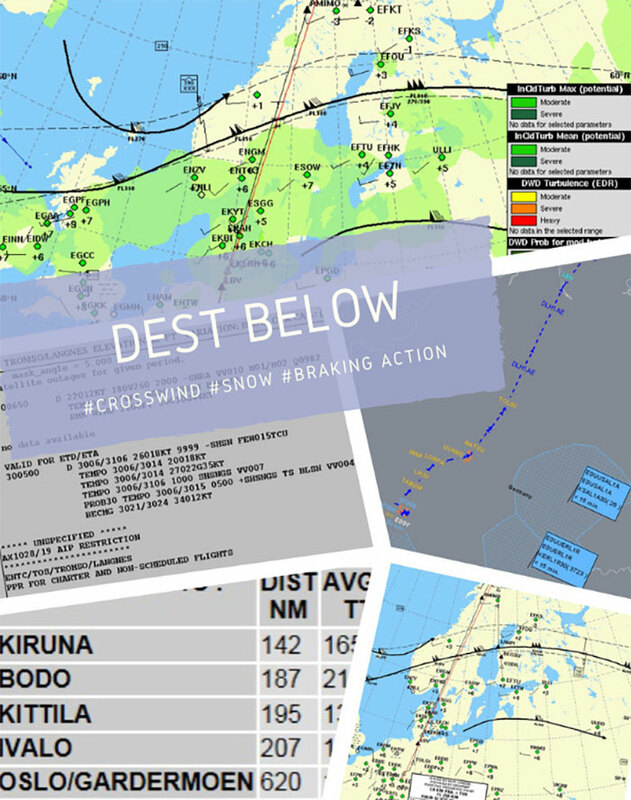 Searching for alternates for Oslo, Turku and Helsinki, and also if they are available for my aircraft type, it came out, that Turku and Bodø might work (from the „weather point of view“) … okay: I made up a plan. Once all was set up (reading NOTAM, weather, routing, enroute NOTAM, airspace availabilty to avoid SLOT delay ….) I rechecked the weather again: a new forecast did came up in the meantime for the DEST and the ALTNs. I now could assume that the DEST was no longer unsuitable, and that I could choose a nearer alternate, what I did, but keeping Turku for info. I rechecked everything again, filed my flightplan and went down to the crew briefing. It was a wonderful calm flight … blue sky, no turbulence, no traffic, no nothing. But still very bad weather at Tromsø/TOS. Our passengers were briefed, that a landing was not very likely with this kind of wind and weather … but my cockpit crew wanted to try – according to the forecast there was still a chance. It took us about 3 hours flying time to get there – we did not know if we could land, as in the meantime the aerodrome was closed for traffic due to heavy crosswind. We did the same: with wind exact on the nose, „good sight“ and cleaned up RWY … we could land. The ceiling, the braking action and our crosswind … finally all was suitable, and we arrived at TOS! Yeah … Just great! 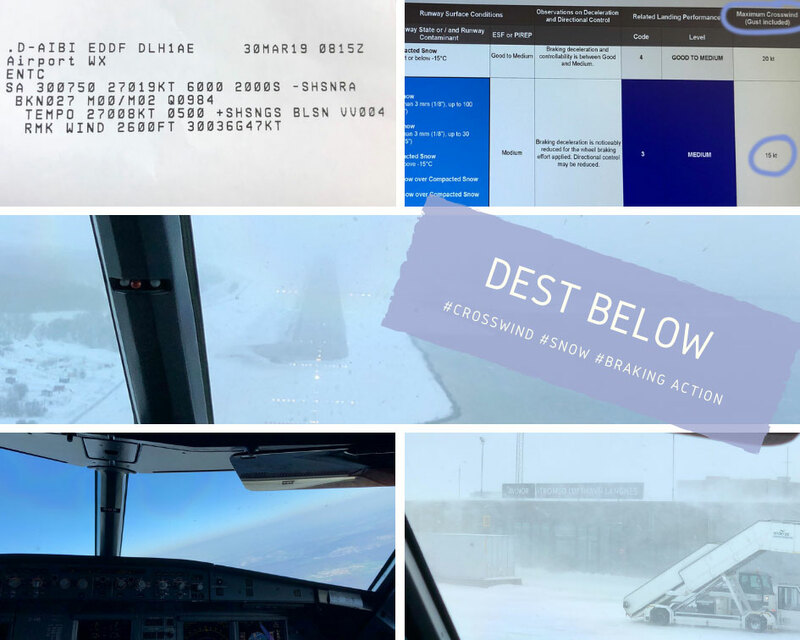 once the cabin crew did open the doors … the wind and the snow entered the plane – exact horzontal! And it was very much snow and very much wind! At home we had a wonderful spring day … here in Tromsø we still had winter! Stormy winter! We call this a „route familiarisation flight“ – for me it was „very much route“ an „very much familiarisation“. Thanks to all crewmembers for this experience! Very nice and interesting report.